You’ll get 2 (sort of 3) hand stitches out of me today, and that’s it. Deal with it. 😉 I wanted to do a third, but once again, I am crunched for time. That’s okay though because you’ll still have a few stitches you can practice and get really good at! We’ll cover the back stitch, a basting stitch/running stitch, and a tack. I’ll aim for at least 2-3 more stitches next week, but we’ll see what happens. Some of the supplies you may choose to use. 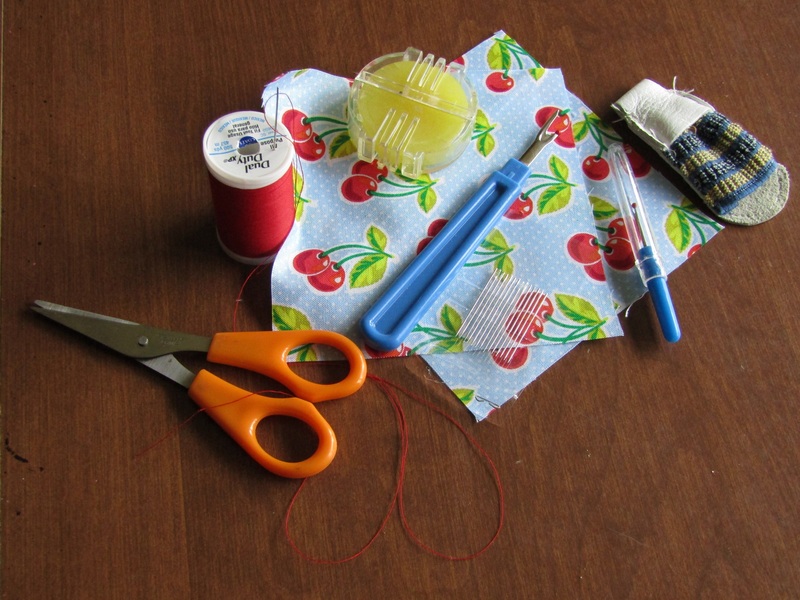 A pair of scissors, a hand needle, thread, and fabric are a must. A thimble can be helpful if you get one that is comfortable for you. The wax is to help with tangled thread. There are two seam rippers, the smaller came with a sewing machine, the larger was purchased. Waxing the thread is NOT a necessary step. I am including this for those who are really struggling to keep their thread from tangling up. The wax makes the thread a little stiffer and helps to keep it from tangling up. The more you pull your thread through the fabric, the more the thread wants to tangle. Keeping your thread at lengths like my mom and I discussed in This Post will help keep that problem at a minimum, but sometimes it’s nice to have one of these around. Dragging the thread across the wax will help stiffen the thread, preventing it from tangling so easily. To wax your thread, you will need one of these nifty tools. The little slits are there as guides for pulling your thread through. All you need to do is hold onto the threaded needle with one hand and the wax tool and the end of the thread with the other. Pull the tread across the wax, and you are done! 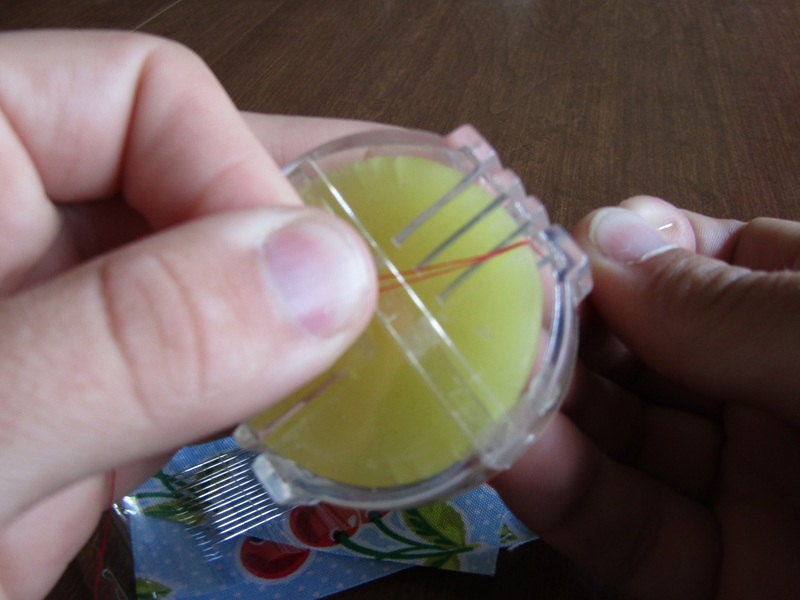 Your wax will get little lines in it from all of that dragging. You can just spin the wax in the holder to get a new section if you need it. The wax can be replaced, but I hardly use mine and have never needed to do so. Basting: A loose stitch that is intended to temporarily hold fabric in place. Sometimes it is used to gather fabric (like for the waist of a skirt), and other times it is just meant to hold things in place. The stitching is easily removed. Loading: To load your needle is to fill it with fabric for stitches. You are filling it with stitches before finally pulling it all of the way through. Whether or not you use a thimble will be entirely up to you. I do not use one most of the time, but then again, I do not do a ton of hand-sewing. My mom will use one much more often than I will. They are especially useful when you are working with lots of layers of material and it is difficult to pull your thread and needle through. Find a thimble that works for you. They are not all created equal! To start, you will need to have your needle threaded (and knotted) as we talked about in this post. We’ll start with the basting stitch/running stitch. While technically two different stitches, they are essentially the same stitch, just relying on using different stitch length to create each type. For the basting stitch, you will start by inserting your needle with the knotted thread into the start of your stitching line (you are just practicing, so make it up as you go… maybe draw a line on your fabric with a pen and a ruler and practice staying on the line), and bringing the tip of the needle back through the fabric. Insert your fabric needle through one side of your fabric (whichever side you start your sewing on is the side your knot will show on My knot will show on the right side of the fabric with what I am doing here. You are now going to proceed to “load the needle” with stitches. To do that, you will insert the tip of the needle up and down through the fabric at regular lengths. To make a basting stitch, you will want to keep your stitches at a length of 1/4″ minimum but make them longer according to your needs (practice doing a variety of lengths, but for each row, keep your lengths consistent). Continue to put the needle up and down through the fabric. If you just hook the needle partially through the fabric, you can load the needle with stitches as seen here instead of slowly making a single stitch at a time. With the needle threaded, push the needle through. This motion of pushing the needle through is one reason people would wear thimbles while sewing. After the needle is well loaded with stitches, you will need to pull the thread and needle out of the fabric (keep your needle threaded if you don’t need to replace anything. when you pull the thread through, flatten your row of stitches and get the fabric to lay flat. Your needle should have gone up and down through the right side of your fabric with stitches being an equal length on the right side as they are on the wrong side of the fabric. I have seen people make little marks on one of their fingers that they will use as a guide to keep their stitch spacing consistent. I just eyeball it. Do what works for you. If it would help you for practice sake, you could use a pen or a pencil to mark your fabric at say… 1/2 ” increments. Your needle goes into one mark and comes back out the next, in one, out the next, over and over. Continue to load stitches on your needle until you finish a row. Once the stitches are completed, flatten the work out so it lays smooth, or practicing gently tugging on it to get them to take some rest. To do the running stitch, you are going to do exactly what you did with the basting stitch, only your stitches will be much smaller. The length of your stitches will be entirely up to you. 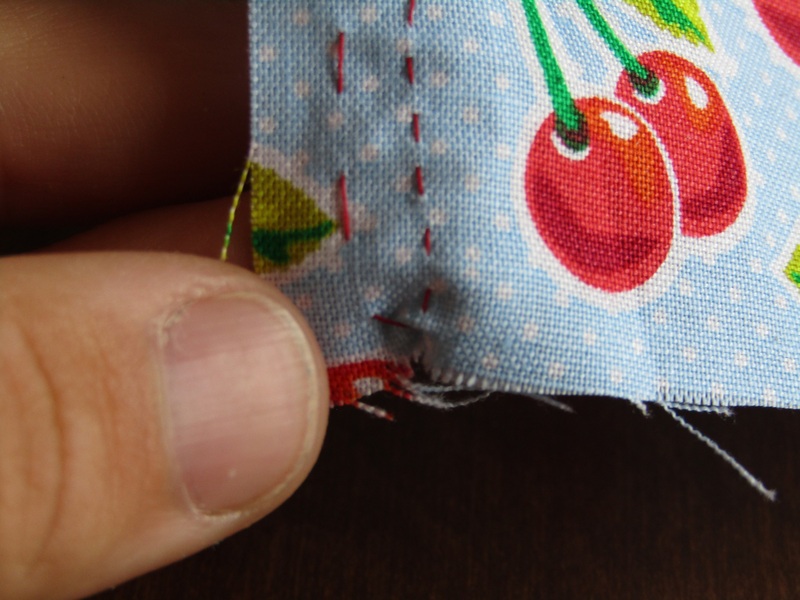 This is the stitch that would probably be most commonly used for the inside seam on clothing if you were to do it by hand, or it would be used as a seam on quilts in the same manner that the sewing machine could be used to create the same type of seam. This is your basic, straight stitch. Of course, it doesn’t have to be straight, but you should practice for that to get accustomed to it. Loading the needle with small, even stitches for the running stitch. Getting ready to load even more stitches onto the needle. This is a very heavily loaded needle, and you would likely not want to load your needle that heavily. Doing so will make it harder to get even stitches and harder not to drop a stitch. Here you can see a side by side of the two different stitch lengths. Basting stitch on left, running stitch on right. Your back stitch begins like any other stitch. I started with my knot coming through on the top side of the fabric, but you could do it on the bottom side. I always begin by pulling my thread all of the way through so that my knot is secure against the fabric before beginning. You are essentially doing a repeating pattern of a short stitch followed by a long stitch. The back stitch is a way to create a stronger seam than just with a simple running stitch. A running stitch could probably be pulled loose with a pull of the thread, but a back stitch will not. With your knot in place, start by making a single stitch forward like you would for a running stitch (down through the fabric and back up). The length of that stitch will determine the length your stitches look on the top side of your fabric. Pull the needle and thread all of the way through, bringing the thread back towards your original thread. Insert your needle back into the fabric where you put the needle down to begin with. To begin your back stitch, you will start as you did before with your thread knotted, and pulling your thread all of the way through. Choose your stitch length and do a single stitch like a running stitch (down and back up). Pull your thread all of the way through on your “up” stitch (when the needle comes back through the top side of the material), and pull the thread back in the direction of the original stitches. There is a gap between stitches where your needle went down and up…put your needle back in the same place where it went down before. Your needle will be going back through the fabric, exiting on the bottom side of the fabric where it will look like there is already a complete stitch. Pull your thread all of the way through. You are now going to make a long stitch on the back side of your fabric, skipping over the first stitch on the back side. Put your needle through and pull. There will be a long stitch and a short stitch overlapping. From the top side, you will repeat what you already did. your needle will exit the fabric half way through the long stitch on the back. You cannot load your needle the way you would with a running stitch, so don’t try. Here is a side view of my needle partway through the material. When you look at the bottom side of the fabric, this is what it looks like as you are putting your needle back through where your first “down” stitch was. Finish pulling your thread through the fabric. It will look like two stitches on the top side of your fabric. You now need to do an “up” stitch. From the end of the last stitch (not where the thread is coming through the fabric on the needle), you will want to go one stitch length over and stick your needle through going back up. Start pulling your thread and needle through. As you finish that portion of the stitch, you will have one shorter stitch and one longer stitch overlapping, but the top side will look like two stitches and then there will be a gap between the last stitch and where the thread comes back through the fabric. Once you have your initial stitches in and you understand how the back side of your fabric and stitching will work, you can simply focus on the front. You are going to continue making stitches, but now you will make a back stitch and what will look like a single running stitch as you progress forward. Pull through and repeat until completed. Once you get the hang of it, you can see the pattern and won’t really need to check on the back side of your work. The needle will go in (down) where the last full stitch was completed, and come pack up where the next stitch will start. To finish your row of stitching off, do a stitch backward, but come back up through the same spot you did before. As you pull your thread through, this will create a small loop. Put your needle through the loop and pull gently. When the thread is all of the way through, hold the thread near where it exits the fabric, wrap your needle around the thread, and pull the need through the loop (because of the way you are holding it, it will look like you are pulling the needle over the loop). If you miss the loop, you’ll know. It should be like tying any other knot (reference this post for more help). As you are pulling your thread through, you should be gently pinching your fabric and loop where the thread leaves the fabric, right where you want the knot to form. Pull until tight. Clip your thread. You can make another knot if you wish. When you are ready to knot off, do not make a long stitch on the bottom side, just make the thread go down through at the end of the last completed stitch, and back up where the final stitch will be completed. This will start to create a loop. Pull your thread most of the way through, and then put your needle through the loop and pull until the thread is snug. Hold your thread close to where it exits the fabric, and wrap your needle around to make a loop, pulling the thread through the loop. With your thumb gently applying pressure when the knot is being formed, pull your thread until it is tight. 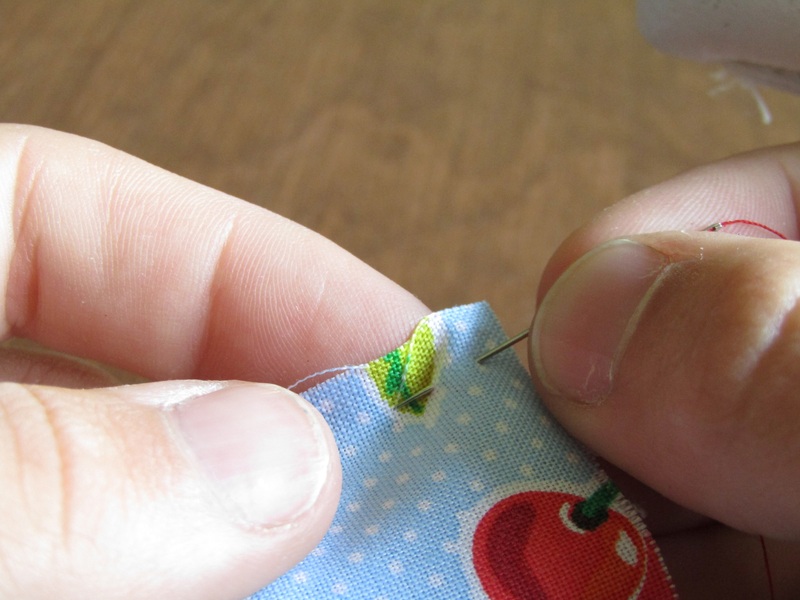 A tack can serve a similar purpose to a basting stitch. It is typically meant as a temporary way to hold something together. If you have ever ripped a tag off of a pair of pants or other clothing, you might have been left with some thread that was used to tack the tag in place. Tiny bows on little girls clothing are often tacked in place. Those are tacks that are a bit stronger, but other ones are lighter and can be more easily removed. Sometimes in my work, I need to connect something small and delicate to my fabric, and I will opt for a tack because I can keep it tiny and avoid using bulky knots. this is not ideal for something you want help permanently in place. To make a tack, you will begin much as you would for a running stitch (down and up), pulling your unknotted thread nearly all of the way through the fabric, leaving just a short tail. You can leave a longer tail to start with if you are not comfortable with this and go back and trim it later. A sturdy tack should be small. The smaller the tack, the tighter it will be. If you are using too delicate a fabric, you will need to catch more threads than you would for something as thick as a cotton. Make a back stitch, but come back up through in the same place you did before. Repeat this loop of stitching 2 or 3 times for a gentle tack, a few more times if you need something a bit more durable. On the final stitch, bring your thread back through the top and clip close to where the thread exits the fabric. Start with a length of thread on your needle that is not knotted, and make the beginning of a single tiny running stitch. Pull your thread until the tail is very close to pulling through but not far enough that you pull it all of the way through. Gently tighten. If you pull to hard, your thread may come loose. Repeat the stitch in the same spot 2, 3 or more times. It should look something like this. You can clip your threads close, but be cautious to leave a small tail on either side. If you are feeling confused about any of this, take the time to study the pictures. Get on your desktop or lap top, and click on the individual pictures if you need to. The words make it sound more complicated than it is 🙂 If you still have questions, let me know, and we will do what we can to clarify! Please, let us know in the comments how you are doing with everything so far. 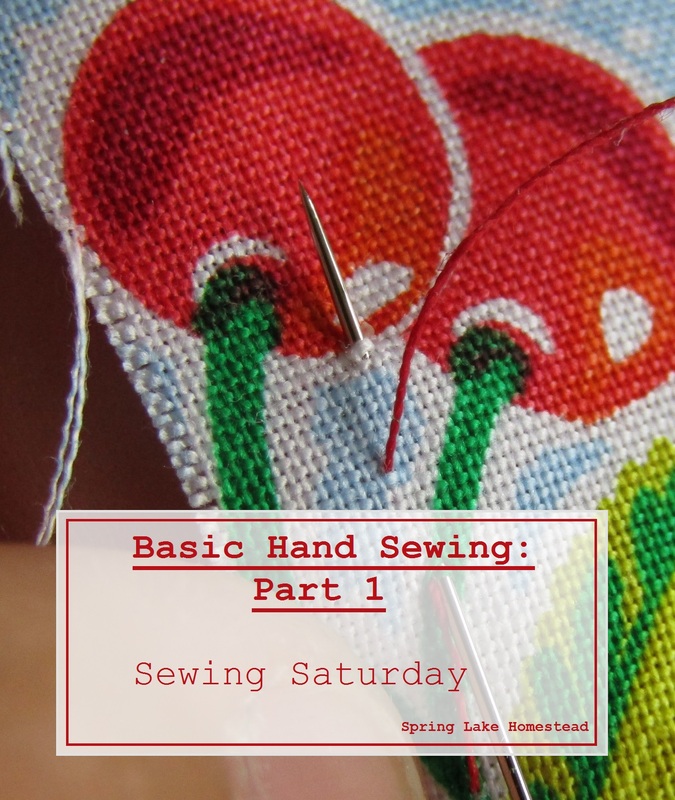 Don’t out today’s other post on setting up your sewing machine, and don’t forget to share these posts with others! This is AWESOME! I’m a few months behind, but I’ve been sewing all day (I have to take a break now, because my eyes hurt…), but I’m happy with all I’ve learned with the hand-stitching and the sewing machine! Thank you for helping me get it all up and ready to go! AND…I already sewed a button onto a pair of Dakota’s shorts that he broke back in probably April. So, he was very happy when he came home too. I’m SUPER excited to keep going with this! Yay! That is so exciting to hear Megan! I’m so glad to hear you’re having fun with this. You seem to be catching on quickly 🙂 And glad you were able to help your new hubby!